Hey there, the weather here today was better than the last several days and the temperature actually climbed above -10 Celsius this afternoon. According to the weatherman, snow is on the way but so are warmer temperatures for this weekend and next week, yippee. Seeing as each day the light of day remains a few moments longer, to me this a great and I cannot help believing that Spring is on her way! Mind you February and March can always lead to weather surprises everywhere, but I am looking forward to Spring. Today was sort of lazy for me, not much in the way of sewing took place, instead I went with my neighbor to a village not too far from here and did a bit of shopping for a few groceries I felt I wanted, not necessarily did I need, but, more on the side of wanting. For instance, I wanted to make baked beans this weekend, but didn't have molasses, now you can't have great baked beans without molasses, can you? Maybe I shall have many more lazy Fridays in the coming months. Seeing as I have made the choice to opt out of all my charitable works for this one year and concentrate on myself with time allotted for just whatever it is I might wish to do. I was also surfing the fabric retailers on the net and one of my most favorite places for fabrics after the Missouri Star Quilt Co. is Shabby Fabrics. The shop is having a great sale, and also provides free patterns, and if your into fuseable applique and houses/cottages (I just love house and cottage blocks) there in the free pattern section is a whole set of 12 X 12 Country Cottage blocks, a block of the month project representing each month of the year, what fun and they are not difficult to make up either. The instructions make it so easy to understand and carry out. Want to see them, then click here! 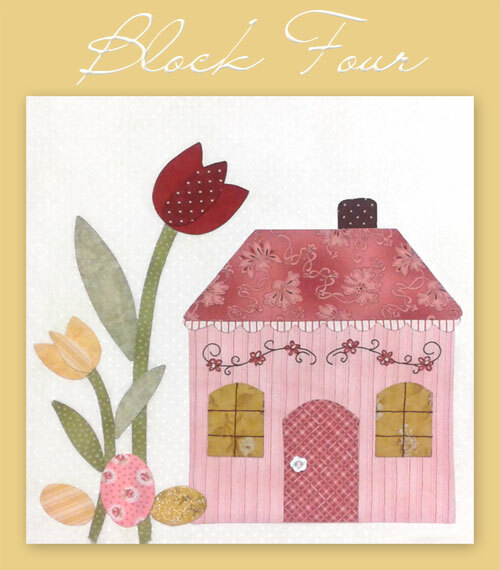 - these are so very pretty blocks and as I am not certain how long they will remain up on the site, if you want them you may wish to download them soon. I am a follower of the Shabby Blog and Jen is none too shabby herself and has such great taste for the most perfect choices of awesome fabrics. If you have never visited the Shabby, why not go for a visit and meet Jen and her everything quilt related. Thank you got stopping by today and sharing some of your time with me, I do so appreciate meeting and making new friends and hoping some of my old friends from my previous blog will find me again and stop by also. by every blogger, that is when we know your reading us.